Crosley manufactures a series of clothing dryers for home use. The dryers come in a variety of sizes and have different features for easy use. Crosley dryers may, from time to time, experience problems that hinder the function of the machine. When a problem occurs, troubleshoot the machine and try to fix common problems without a service technician. A man is looking into his clothing dryer. If your Crosley dryer does not function when the "Start" button is pressed, make sure you have chosen a cycle and that you hold the "Start" button for at least two seconds. The dryer will not begin a cycle if a cycle hasn't been set or the "Start" button is pressed and released too quickly. Next, make sure the power cord is plugged into a working power outlet. If there are several devices plugged into the outlet, you may have blown a fuse or tripped a circuit breaker. Replace the fuse or reset the breaker and unplug the other devices from the outlet. The dryer should be placed on a different circuit to avoid this problem. Finally, if you are still unable to start the dryer, the machine's thermal limiter may have tripped. Only a qualified service technician should replace the thermal limiter. You may find your Crosley dryer is taking an uncharacteristically long time to dry your clothes. The cause is often restricted airflow into or out of the machine. Check the lint trap to see if it is clogged, and clean it as necessary to improve airflow within the dryer. If the lint trap is clean, check the exhaust hose and vent for obstructions and clean them as needed. In addition, the outside exhaust hood or duct may be bent or damaged in another fashion. Repair or replace the exhaust hood or duct if the damage is restricting airflow out of the machine. Another potential cause of extended drying times is high humidity in the location of the dryer. You may need to move the dryer to a location with lower humidity or place a dehumidifier in the room. If load after load of laundry coming out of a Crosley dryer has excessive wrinkling, make sure you are not overloading the machine. 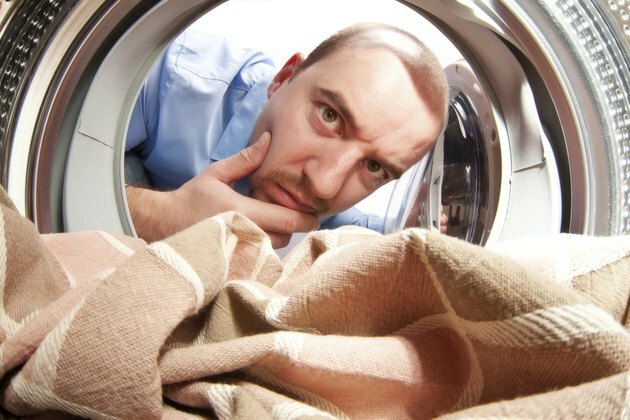 Too many items in the dryer may hinder tumbling and airflow through the fabric, which may add to wrinkling. Make sure you remove the clothing from the dryer shortly after the cycle is complete, which will reduce the amount of wrinkling. In addition, Crosley dryers can be set to several different temperatures, some of which feature high heat. High temperatures may add to wrinkling. Check the tags on your clothes for drying instructions, and sort clothes according to similar instructions.